"Imagination cannot picture an approach of greater magnificence, produced by circumstances which ages alone could bring about, and of which ages alone can produce a rival." The Copper Horse on Snow Hill, and the view north along The Long Walk towards Windsor Castle and the George IV gateway. This picture was taken in the 1930s and shows the young Horse Chestnut and London Plane trees shortly after the replanting of the Long Walk. 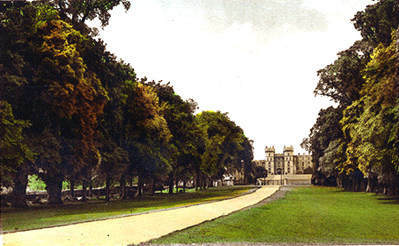 The removal of the old trees along the full length of the Long Walk was not completed until 1946. 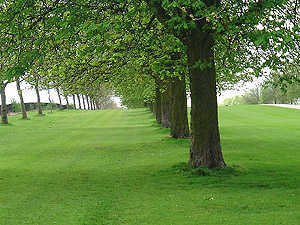 The Long Walk was commenced by Charles II from 1680-1685 by planting a double avenue of elm trees. The central carriage road was added by Queen Anne in 1710. The original planting comprised 1,652 trees placed 30 feet apart in each direction. The width between the two inner rows was 150 feet, and overall 210 feet. It is a little less long than the three miles of popular rumour being around 2.65 miles (2 2/3rds miles or 4.26 km) from George IV Gateway at Windsor Castle to The Copper Horse. 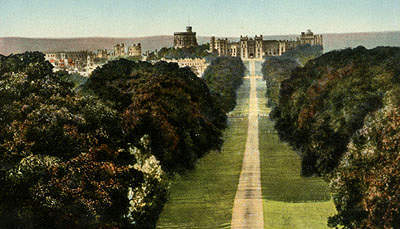 In 1859 a Commission, of which the Duke of Bedford was President, inspected the Long Walk, and recommended ("...after mature consideration...") that the old trees, when dead, dangerous, or decayed, should be gradually replaced by young elms between the Castle and the Double Gates, adjacent to Park Street, but from that point to the Statue of George III on Snow Hill, the soil proved unsuitable for elms and so there should be a gradual substitution of oak for elm in that part of the avenue. This plan was therefore adopted on a small scale in 1861, when a small enclosure was planted with oaks on the east side in the line of the Avenue. In 1879, three other enclosures were formed on the same principle, one either side of Snow Hill, and another opposite the plantation created in 1861. 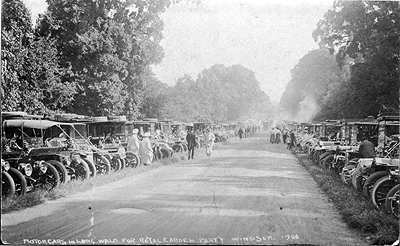 Elms were felled and replaced with Horse Chestnut and London Plane working north from the Copper Horse end, significant work being undertaken in 1921 and in the early 1930s at which time the decision was made to widen the distance between the lines of trees on each side of the avenue. The Long Walk in the early 1900s. Many of the trees by this time were in need of replacement. 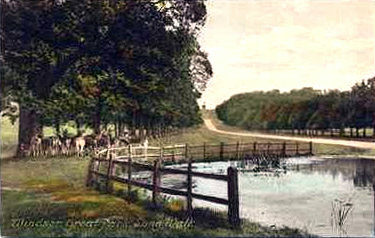 The pond in the Long Walk photographed at the turn of the last century, around 1900. The pond no longer exists, though we have no record of when it was filled in. Following an outbreak of elm disease at the beginning of WWII, the avenue at the northern end was felled in 1943, work starting on 30th August of that year, with the entire replanting completed by February 1946. 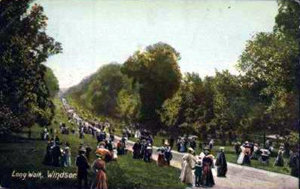 The avenue as we know it today at the northern end dates from that time, planted with London Plane and Horse Chestnuts. The original plan was to decide after a period of thirty years or so which species to retain, but during the subsequent thinning in the 1970s, the mix was retained. 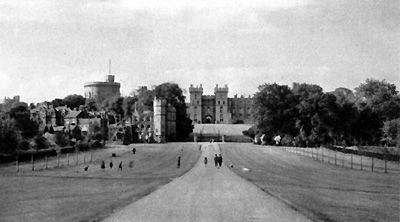 Arriving by road from the south-east, from Old Windsor, you will cross The Long Walk and enjoy views up and down the avenue, towards the Copper Horse southwards, and the Castle to the north. NB There are no official parking places nearby, and cars and cycles are not permitted to ride along the Long Walk. If arriving by coach the driver will slow down for a few moments to allow photographs but will be unable to stop. Car parking may be possible in the side roads to the west, but the best plan is to park in one of the town centre car parks and walk east from The Guildhall past the Parish Church into Park Street, entering the Long Walk through the Park Street gateway, middle left of the picture above and below. 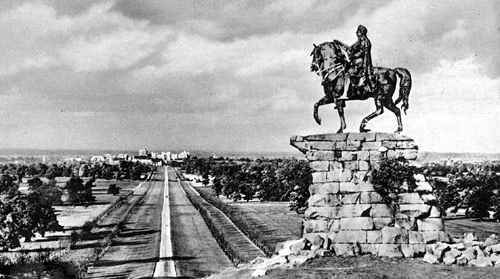 The History of Windsor Great Park and Windsor Forest. Wiliam Menzies was Deputy Surveyor of Windsor Great Park from 1849-1878 and Thamesweb are planning to create a facsimile edition of this rare publication. If you would like to have more information or enjoy a significant discount by registering as a pre-publication subscriber, please contact The Editor. FURTHER RECOMMENDED READING: 'Royal Landscape,' The Gardens and Parks of Windsor, Jane Roberts, Yale University Press, 1997. This book contains a mass of information about the Parks, and is gloriously illustrated.